How about letting go of old habits and ending the year on a high note? At the beginning of each new year, most people make a list of things they wish to accomplish. However, few will have been accomplished by the time December comes around. One by one, most resolutions are abandoned throughout the year – or, in many cases, even before the end of January. Entrepreneurs, translators and other professionals will be happier if they let go of some bad habits that harm them, lower their productivity and prevent them from achieving success and personal satisfaction. Social networks are the main cause of procrastination in the workplace. Losing oneself in Facebook posts may even be fun, but it is incapacitating and distracting. Only use Facebook, Instagram, Twitter and other social networks during leisure time. Also turn off notifications on your phone. If someone has an urgent need to contact you they will phone you and not send you a message. A study conducted at the University of Utah, in the United States, shows a rather surprising result: only 2% of people can in fact perform more than one task at the same time. According to this research, the brain of so-called “supertaskers” is different from that of the remaining 98% of the population. Thus, the odds of being part of the group of people who can truly multitask is small, and it is therefore not worth trying to multitask. When you want to focus on a particular task, close all application and browser windows on your computer, except for those that are actually needed to accomplish the task at hand. You cannot win at the game of comparison. There will always be someone more intelligent, beautiful, rich, and [apparently] happy than you. A professional must be able to focus on themselves, on their goals, health and state of mind. In fact, it’s not worth constantly complaining about everything, for no good reason whatsoever or over all the evils of the world. Pay attention to what you say. This not only affects you but also the people around you. The more positive things are said, the more positive things happen. A professional must be an optimist. Some scepticism is always good but the pessimist does not change the world, does not motivate others and does not have innovative ideas. Pessimism only brings those around the pessimist down. If certain people do not love or support you there should be no room for them in your life. However, the idea is not to seek confrontation, but to stop making yourself available. These people will not notice your reduced availability, because they are very focused on themselves. Less meetings means more productivity. Schedule the meeting, share your ideas, deal with the points on the agenda and go off to do what you need to. Meetings need to be productive. Create an agenda for each meeting with the topics that need to be addressed. While checking the subjects, ask your colleagues to share what task they are working on and what work they have already completed. It works better and will reduce the time spent in meetings in half. Many professionals live life listening to that voice in their head that constantly says “I’m not good enough” or “I can’t do it”. 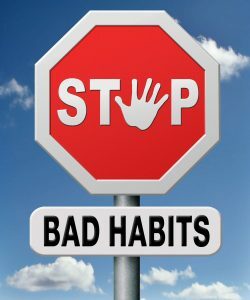 You need to let go of this habit and stimulate some other, which keeps you productive. Working, exercising and contributing positively to society are some of the habits that can make you happier, whole and successful. At a TEDGlobal Conference in 2010, entrepreneur Derek Sivers explained this idea: when we announce to the world what we want to achieve, the brain is lead to believe these goals have already been achieved. This implies that the effort and focus which are required to achieve them will be diminished. If you’re an entrepreneur, remember that there are a number of variables that are outside of your control. There is no point spending nights awake in worry about what cannot be solved. It is a waste of time, energy and resources. We can only control what we eat, what we think and what we do. Instead of focusing on the new habits we are going to build or the new goals that we are going to pursue, it may be more productive to focus on those habits that are holding us back and preventing us from being better, and to slowly try to change and eliminate them from our lives. There are still 5 months to go until the end of the year. If we can avoid carrying on with any of these negative habits, we will have a successful year, and one that is more in line our expectations.